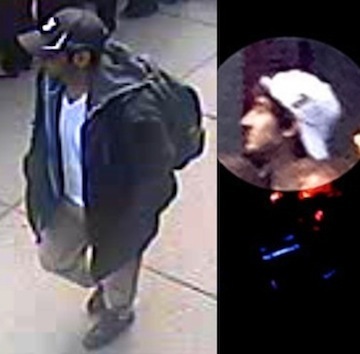 The Federal Bureau of Investigation have released a video and photos of two men who are thought to be responsible for the bombing in Boston which left three dead and around 183, including nine children, injured. Suspect One has dark hair and was wearing a black forward-facing hat, a white shirt and khaki pants while Suspect Two had a white backwards hat, dark hair and a black jacket with white trim. Both had backpacks thought to contain the pressure cooker bombs later discovered by the bomb squad. The FBI is asking for the public’s help with the case, advising anyone to submit additional information, footage or photos to bostonmarathontips.fbi.gov or to call their offices (1-800-225-5324, prompt #3). President Obama called the perpetrators of the heinous act “small, stunted individuals” at a memorial service for the victims in Boston late Thursday morning. Next Next post: Time Magazine’s ‘Most Influential’ List Includes Jennifer Lawrence, Kim Jong-un, Jay-Z, The Obamas and CHRISTINA AGUILERA? ?